Changes the appearence of at least windows (minimize, maximize, & close button) but preferred it would also change actual buttons, loading bars, checkboxes, etc. Note: This does not have to be free as long it is a one-time purchase and not a subscription. 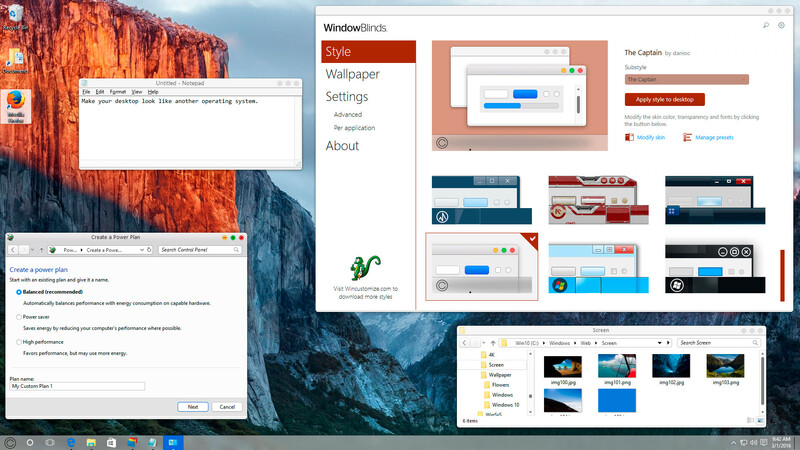 One that I found and paid for ($10) is called WindowsBlinds by StarDock. It's quite wonderful being that it allows you to change the appearance to not only the look of a mac but also many OS's as well. It changes the appearance of windows, buttons found within them, radio buttons, checkboxes, progress bars, scrolling bars, start menu icon, and more. I have found a few bugs here and there with very old programs but the software gives you the option to toggle what it changes. It even has a styling package called "El Capitan". This software meets all my requirements. WindowBlinds is a computer program that allows users to skin the Windows graphical user interface. It has been developed by Stardock since 1998, and is the most popular component of their flagship software suite, Object Desktop. Windows software to make knowledge network graph?